Although the pathogenesis of psoriatic arthritis (PsA) is not fully understood, the pleiotropic inflammatory cytokine interleukin-6 (IL-6), which has a known role in synovitis, local and systemic inflammation, and the promotion of bone resorption in rheumatoid arthritis (RA), may play a role. Serum levels of IL-6 are increased in patients with psoriasis, and the up-regulation of proinflammatory cytokines, including IL-6, in PsA synovial tissue has been reported. In patients with PsA, IL-6 levels correlate with the number of affected joints, elevation of the erythrocyte sedimentation rate, and C-reactive protein (CRP) level. Additionally, a few case reports of successful use of anti–IL-6 receptor biologic therapy to treat PsA exist, although results have been conflicting. Taken together, these findings make IL-6 a potential therapeutic target in PsA. MAUI, HAWAII – The effectiveness of methotrexate in psoriatic arthritis is a matter of debate, but Dr. Arthur Kavanaugh is a believer based in part upon a recent subanalysis of the TICOPA study. Moreover, his new 5-year follow-up analysis from the GO-REVEAL study of golimumab (Simponi) with or without concomitant methotrexate suggests that methotrexate plus the tumor necrosis factor inhibitor provided synergistic efficacy, he said at the 2016 Rheumatology Winter Clinical Symposium. The 5-year analysis doesn’t provide definitive proof of synergistic benefit because it wasn’t designed or powered with that endpoint in mind (Arthritis Care Res. 2016;68:267–74). No randomized trial completed to date has been. But the first-ever trial set up to test the synergistic efficacy hypothesis is underway. It’s a 52-week, double-blind, multicenter, randomized trial of etanercept (Enbrel) and methotrexate versus either alone in combination with placebo. And while the Amgen-sponsored study won’t be completed until 2018, Dr. Kavanaugh is ready to predict the outcome based in part upon the message contained in his GO-REVEAL findings. In a phase 2 study, the inhibition of the interleukin-17A receptor improved signs and symptoms of psoriatic arthritis. 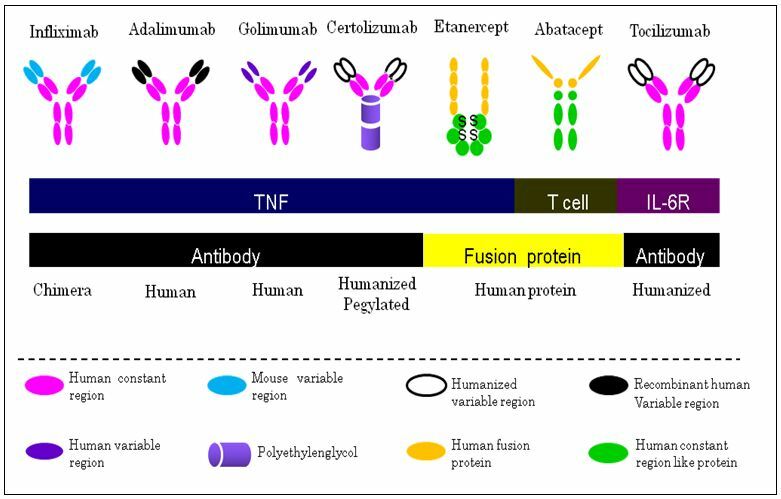 We sought to evaluate the efficacy and safety of secukinumab, an anti–interleukin-17A monoclonal antibody, in such patients. They are complex proteins, mainly monoclonal antibodies, that block other proteins (called cytokines) involved in inflammation in RA. One of the most prominent pro-inflammatory cytokines is TNF. Therefore, the first biologics were designed to block TNF. Apart TNF, interleukin 6 (IL-6) is another cytokine involved in inflammation. Tocilizumab (RoActemra®) is the first anti-IL-6 approved to treat RA. Tocilizumab is administered IV monthly but recently a subcutaneous formulation has been launched. Interestingly, a biologic that years ago was used to treat non-Hodgkin lymphoma -Rituximab- was shown to be useful in RA. Rituximab is administered IV at least once every six months. (Mabthera®). This biologic acts against B lymphocytes, which are responsible for producing antibodies. Finally, another relevant biologic is Abatacept (Orencia®). Abatacept interferes with the contact between the interaction of two types of lymphocytes (T and B) that are essential for the harmful effects of the disease occur. Abatacept has an IV presentation but recently a subcutaneous presentation is in the market. Until recently only anti-TNF had been licensed to treat this disease. Recently, a new non anti-TNF biologic Ustekinumab (Stelara®) has been approved to treat PsA. Ustekinumab was launched first for cutaneous psoriasis, but it took a while to demonstrate that it was also efficacious in PsA.